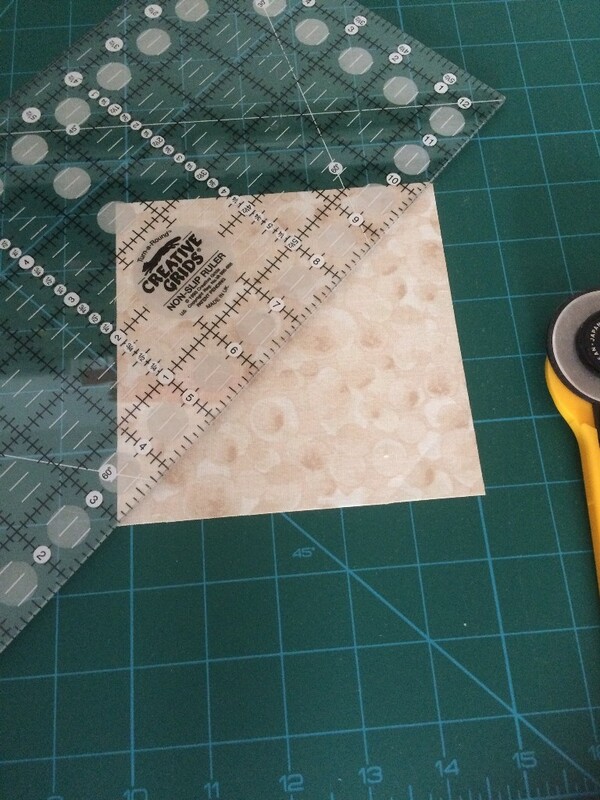 Once you can cut strips and then squares, cutting right-angled triangles is easy. Let’s look at ‘half-square’ triangles first. As you might expect by the name they are cut from a square by cutting it in half across the diagonal. The magic number to remember is 7/8 (seven eighths) as this is the seam allowance you need to add to the finished size of the unit. 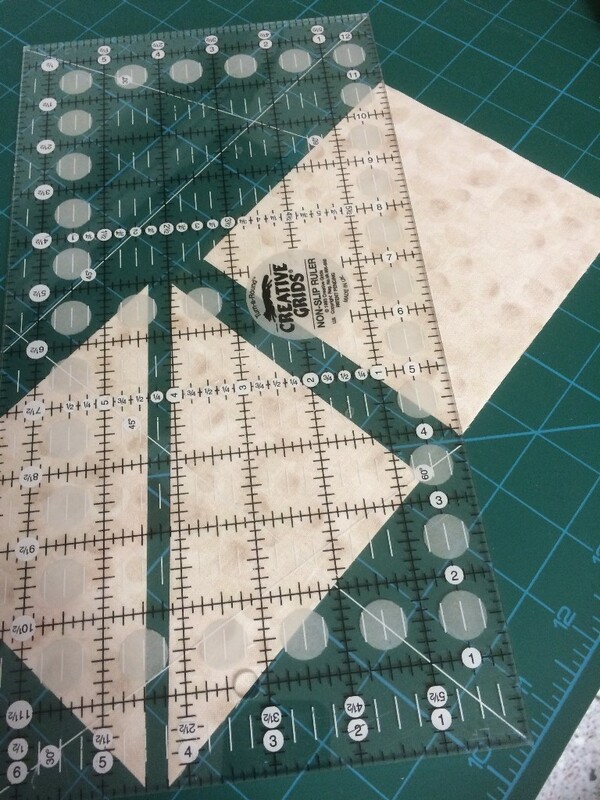 Standard seam allowance in patchwork is 1/4 inch so when cutting squares and rectangles we add 1/2 inch to the finished size of our squares and rectangles when cutting. With triangles we need to add a little more to take account of those pointy ends (technical term). 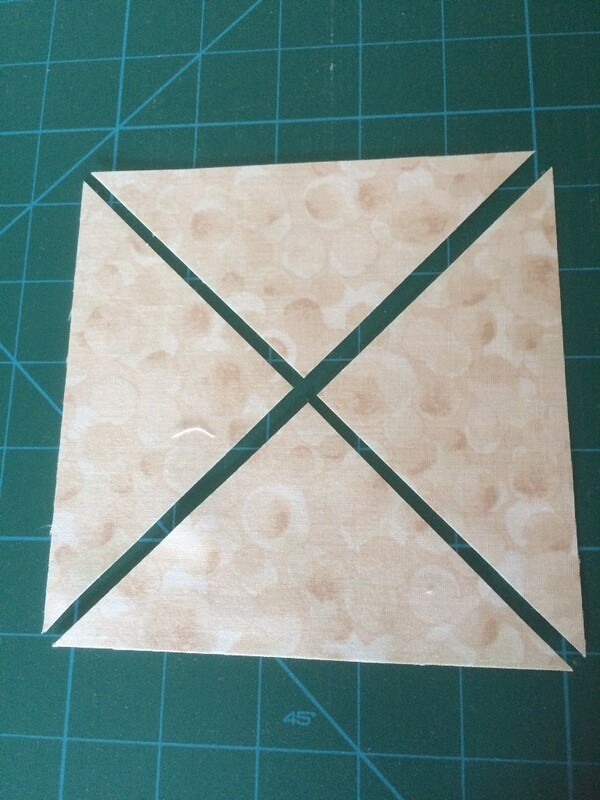 So if your half-square triangle unit finishes at 3 inches once it is sewn into the quilt block then you need to cut the squares 3 + 7/8 inches. 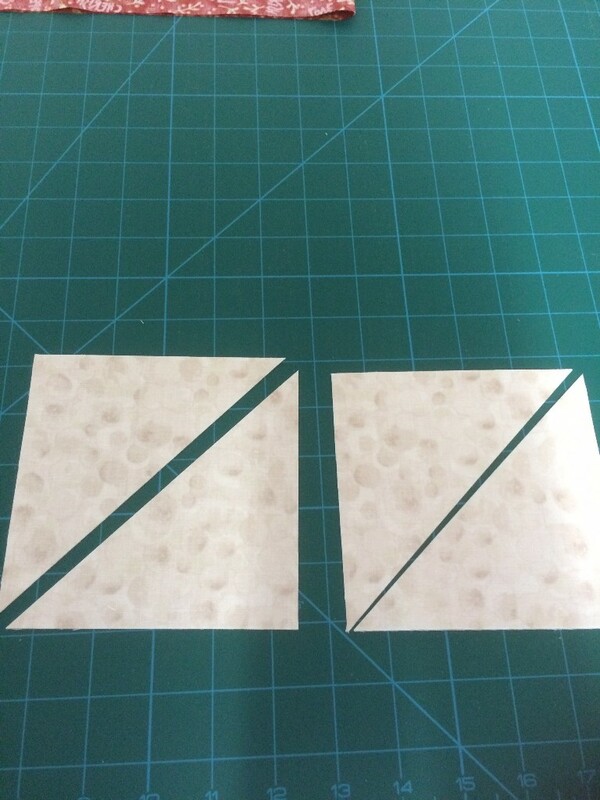 If you need to cut lots of these triangles (and you probably will) then first cut a strip that width. Then cut it into squares. Having cut the squares, keep them in their pairs (or fours) as they came from the strip – try not to move them too much. Place the ruler across the first pair from one corner to the other. If you wish you can use the 45 degree line on the ruler – put it against one side of the square – to be certain you are cutting an exact diagonal; but it is possible to get too obsessive about this degree of accuracy. As before, place the cutter on the mat against the edge of the ruler (make sure there is ruler above and below the line you wish to cut), remove the guard, roll the cutter against the edge of the ruler to the end of the square (and a little beyond) and replace the guard. Lift the cutter from the mat and gently check the cut has gone through all layers. If it hasn’t, don’t be tempted to go back and forth with the cutter until it is all cut through as you will only chew the fabric; likewise don’t tug at it to break that irritating thread that hasn’t cut as you will stretch this bias edge. Instead get a small pair of scissors and just snip the triangles apart where they are caught. Now move onto the next set of squares and repeat until all squares are cut into two triangles. Quarter-square triangles (or QSTs) are, as you might expect, a square cut in four across both diagonals. This time our magic number for the seam allowance is 1 + 1/4 (one and a quarter) inches. So if our finished quarter-square triangle unit is 3 inches we need to start with squares of 4 +1/4. 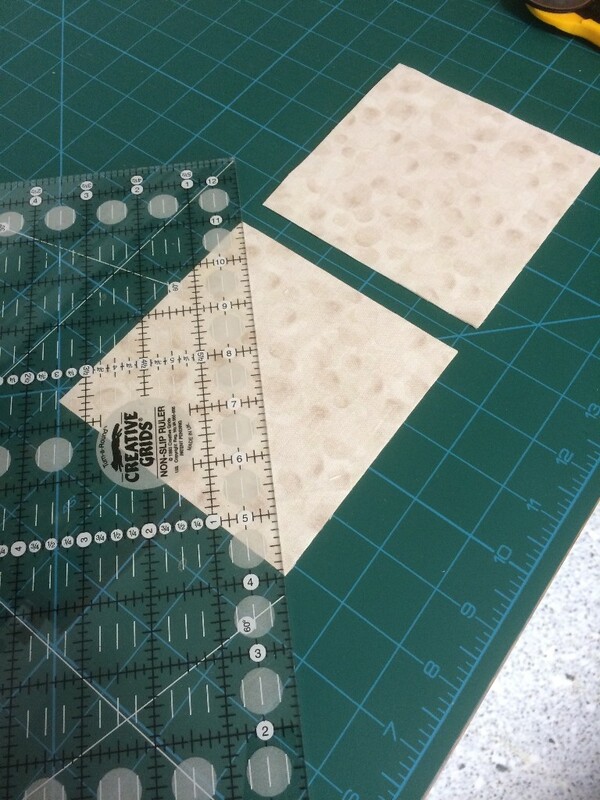 As for the HST units above, start by cutting a strip and then cut this into the right number of squares for your units. Once the squares are cut you can cut them into four. Don’t move them! Cut the first diagonal in the same way as for HST units above. 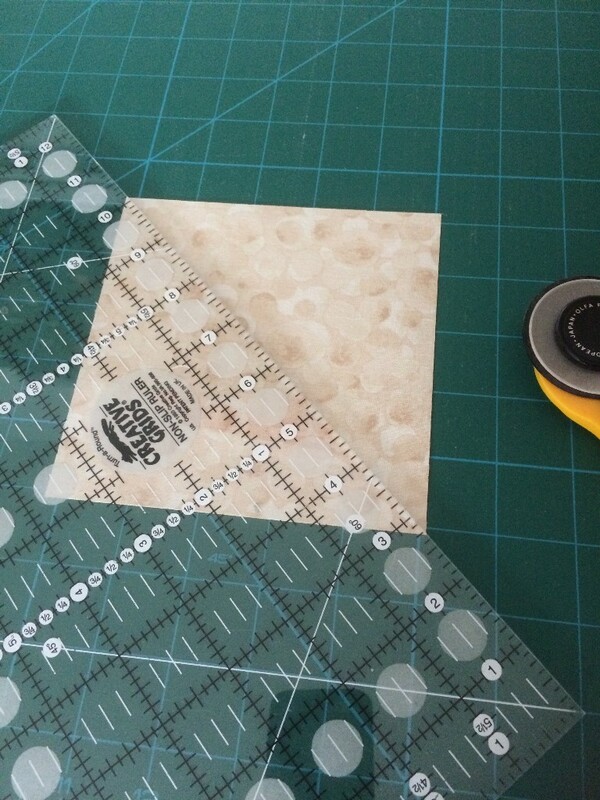 Then, without moving the squares (move yourself), place the ruler on the opposite diagonal and cut again. Repeat with all the squares you require. You will find some tutorials for quick-piecing these triangle units and links to easy blocks on the tutorials page of our sister blog Meadowside Designs. Next time we will look at using the 60 and 30 degree lines on the ruler to cut diamonds and equilateral (60 degree) triangles. This entry was posted in rotary cutting and tagged rotary cutting by Chris. Bookmark the permalink.